Who should be Suzaku's l’amour interest? le choix des fans: "COME HERE BABY!!" Suzaku Kururugi,17 years old (18 at R2),is the deuteragonist of the Sunrise animé series,Code Geass. He is voiced par Takahiro Sakurai,while his child self is voiced par Akeno Watanabe.He is voiced par Yuri Lowenthal in the English dub,and his child self is voiced par Laura Bailey.In the 29th animé Grand Prix, he was 6th place with 143 votes. an article a été ajouté: Is Suzaku a Good Character? a comment was made to the poll: Who should be Suzaku's l’amour interest? a poll a été ajouté: Who should be Suzaku's l’amour interest? 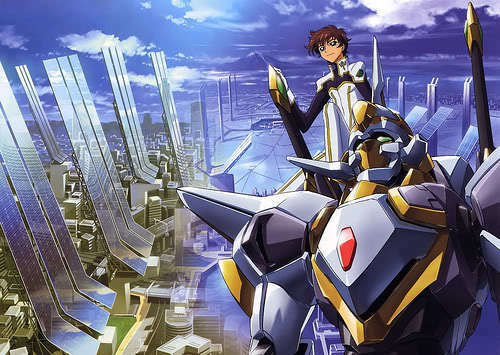 What is the name of Suzaku Kururugi's Knightmare Frame in R2 when it's upgraded?